By: Just van den Broecke - v1 - March 2, 2018 - written @Kadaster/PDOK. This chapter focuses on possible future evolution scenarios for the Smart Emission platform. See the Architecture, Data Management, Components and Dataflow and APIs chapters for the overall design and data processing, APIs and dataflow of the SE Platform. Within the world of SensorWeb and IoT, many platforms are developed and offered. Some with Open Source, others with proprietary source. Data may be Open, partially Open or completely closed. Same goes for standards and APIs used for (web) services. Some platforms are “end-to-end complete”: they include data acquisition from sensors, data management/storage, services and viewers, often in the form of a “Portal” and “Dashboards”. Most of these portals are built with proprietary source, use custom APIs and usually provide subscription models (“Cloud Services”) for end users. Also data is usually hosted at major providers like Amazon and Google, most often not within The Netherlands. Licensing models may change at will. But the convenience is great, often plug-and-play integrations (like with ThingsNetwork). Examples are numerous, we mention just MyDevices Cayenne and OpenSensors. 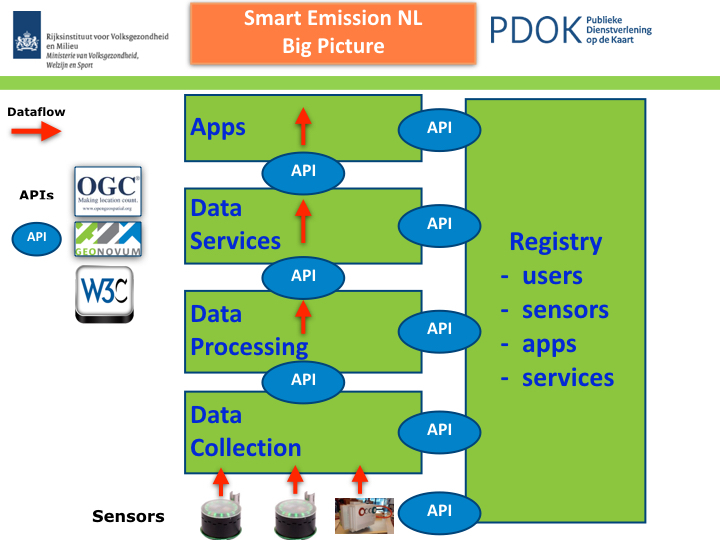 This chapter is not to list and review all major sensor/IoT platforms, but puts focus on a a very high level functional architecture applied to sensor network initiatives within The Netherlands. This section sketches a global and distributed component architecture. From several sensor network projects, including Smart Emission, and discussions a high-level, global architecture emerged of functional building blocks connected via APIs (Standards). This is sketched in Figure 1 below. The image sketches an architecture on the basis of minimal Coupling and maximum Cohesion: blocks have minimal (API) couplings and are maximally cohesive, i.e. perform only specific tasks. What follows is a short description of the functions of each block and its relations to other blocks, starting at the bottom, following the flow of (sensor) data. This block in practice provides one or more Data Collectors. Sensors need to send their data to “somewhere”. Often it is good practice to have a “buffer”, here called a Data Collector that initially receives and stores the data from sensors and makes it available via an API. Examples: within the SE Platform, raw data from Josene sensors is sent using low-level protocols (MQTT) to Data Collectors provided by Intemo and CityGIS. These provide storage and the “Whale API” from which any other platform SE or RIVM can obtain, i.e. harvest that raw sensor-data. Another Data Collector within the SE platform is an InfluxDB timeseries database to which for example the EU JRC AirSensEUR stations send their raw sensor data. The result of this block is that raw sensor-data (timeseries) is stored and made available to multiple consumers. But the data is still “raw”, not yet suitable for applications. NB in addition it is convenient that a Data Collector API always provides a “current/last” dataset from all sensors to data consumers, to allow near-realtime datastreams. Not all Data Processors will provide all these functions, and implementations may greatly differ. In the end each Data Processor will make its “refined” data available for the next step: Data Services. A Data Service in general provides usually a Web API through which consumers, mainly Applications can utilize the refined sensor-data by the Data Processors. In this block Web Service APIs are found: when standardized these are often OGC-based like the Sensor Observation Service, the SensorThings API (STA), but also WMS and WFS. For example the SE platform provides currently (feb 2018) five APIs: WMS (Time), WFS, SOS, STA and a properietary REST API for current sensor-values. For SOS and STA Data Publishers are defined that push data from Data Processors to these respective services (via SOS-T and STA REST PUT). Apps are web-based, desktop or mobile applications that consume refined sensor-data provided via the (standardized) APIs of the Data Services. For example within the SE project several “Viewers” were developed. Some internal within the project like the heron and SmartApp, some external like viewers from Imagem and TNO. This block mainly deals with data and APIs “other than the sensor-data (and APIs)”. Often this is refered to as Metadata (MD) and MD APIs. This block is often overlooked in projects. At least within the SE Platform it has not been explicitly defined as initially there was just one sensor/device type and no users registered. But like in other geospatial architectures this aspect should be taken into account. The success of the above architecture has a prominent role for APIs. Especially when building blocks are developed and deployed in a distributed fashion by different organizations. A few recommendations based on experience within the SE project. The SensorThings API is a relatively new OGC standard. It provides similar functions as SOS, but more “modern” and lightweight. In a nutshell: within STA an E/R-ike model of Entities (Things, Sensors, Datastreams, Observations etc) are managed via HTTP verbs (like GET, PUT, PATCH etc). The OGC STA standard also uses and integrates the IoT protocol MQTT. Via this API the SE Harvesters pulled in data from Data Collectors. This custom Web API was developed (by Robert Kieboom and Just van den Broecke) specifically for the SE project. It proved very convenient to harvest bulk timeseries raw sensor-data. The specification and examples can be found in GitHub: https://github.com/smartemission/smartemission/tree/master/docs/specs/rawsensor-api. Though some providers have developed a “SOS-REST” API with JSON data formats these are product-specific and thus proprietary. Though SensorThings API is very recent and implementations may need to mature, for the future STA seems a better option. A WMS with plain image and time-dimension support. This allows clients to fetch images through history (e.g. with a timeslider in a web-viewer). The WMS OGC Standard provide Dimension-support, in this case time as dimension. This allows downloading of timeseries data with geospatial filter-support. Though WFS could be replaced functionally by SensorThings API. The above architecure could be implemented by multiple organizations. For example on the (Dutch) national level scenarios can be envisioned where local and governmental organizations and parties “from the market” each fill-in functional blocks based on their specialization. This could result in what could be called a Federated Architecture, i.e. no single party provides/controls all building blocks. In theory any party could join (via the APIs and Registry). A good example of such a federated architecture brought to practice is The ThingsNetwork (TTN), a community-driven LoRaWAN network based on well-defined components and APIs. Setup for different purpose and domain but working very well in practice because of well-defined building blocks and APIs, making it extensible as any party can join and add a building block. A Forum with community managers and a central website with documentation, info and portal functions also has a great role in TTN. But this division does not need to be that strict. 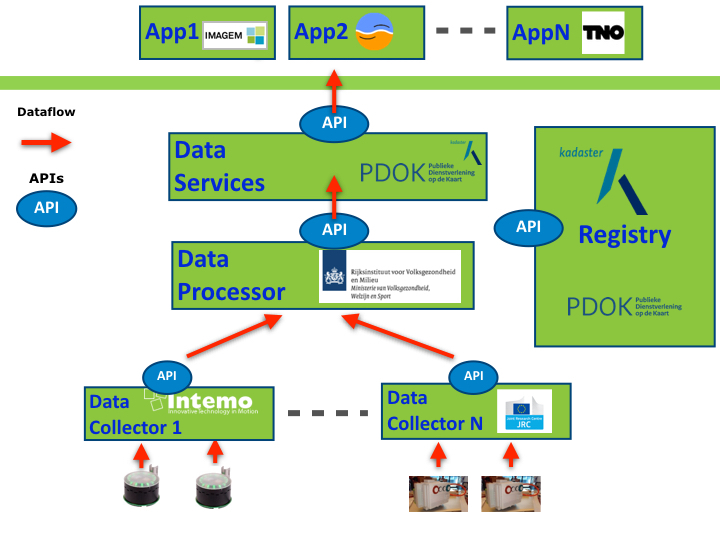 For example RIVM may also host Data Collectors and/or provide Data Services. The point is again: a federated architecture composed by well-defined building blocks and APIs. “The market”, or any other organization would provide the Apps, sensors and Data Collectors. Again, for this to work, agreements on APIs have to be made and favourably components would be developed and reused with Open Source. An (fictional!) example is provided in the Figure above. The roles are not fixed but just for the example. The actual APIs need to be worked out. For the latter we foresee a role for Geonovum, selecting and profiling standards from mainly OGC and W3C.